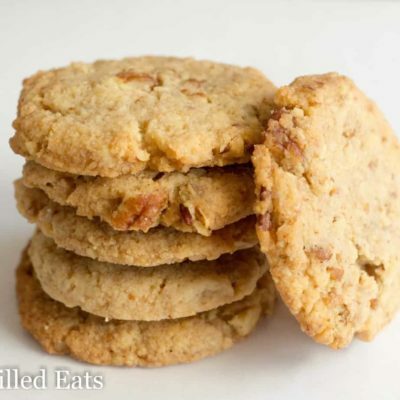 These Butter Pecan Cookies live up to their name. They are buttery and chock full of pecans. They are crisp, sweet, and are the perfect sweet bite after supper. Whether you need eggless cookies or not these are divine. These are one of my favorite cookies ever. I made them for the first time as a newlywed almost 13 years ago when this recipe came in my little Martha Stewart Everyday Food magazine. I’ve made them countless times since. I loved those little Everyday Food recipe books when I had a subscription. As a new bride cooking for 2 for the first time I needed a bit of help. I’ve always enjoyed cooking. My best friend and I used to destroy our moms’ kitchens regularly with our experiments. Like typical teenagers, we did things like put Twizzlers into pancakes to see what would happen. They melted and made a mess. Meg and I had a blast but between crazy experiments and spending my teenage years as a vegetarian, there were many things I needed to learn how to cook properly. In the early 2000s, Food Network wasn’t around that I remember so I resorted to cookbooks and magazines. I still have a folder of dozens of recipes I cut from magazines or jotted down on scraps of paper from cookbooks from the library. 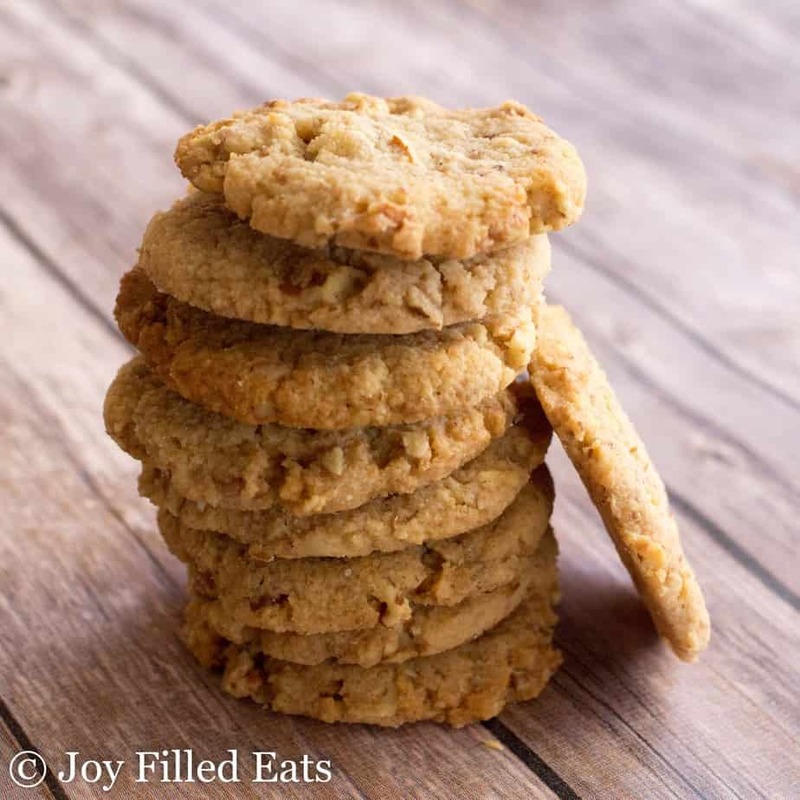 A few of my favorite recipes besides these Butter Pecan Cookies came from the Everyday Food books. Upside Down Cranberry Cake and Cookie Breakup (a crunchy eggless chocolate chip cookie you cook on a sheet pan and break into pieces) to name two. They will appear in healthier versions here at Joy Filled Eats someday! 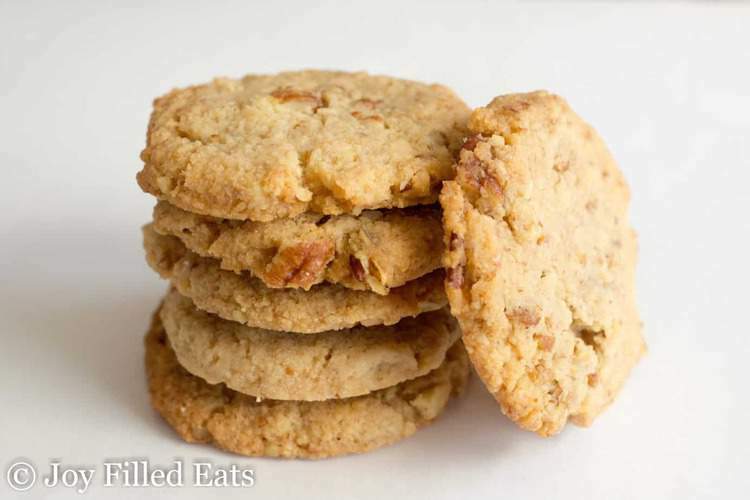 When I perfected my shortbread cookie dough early this month I knew that adding pecans to it would change it into the special sweet known as Butter Pecan Cookies. My husband has always loved these too. He’s not a huge sweets guy but he has a special place in his heart for nut cookies. 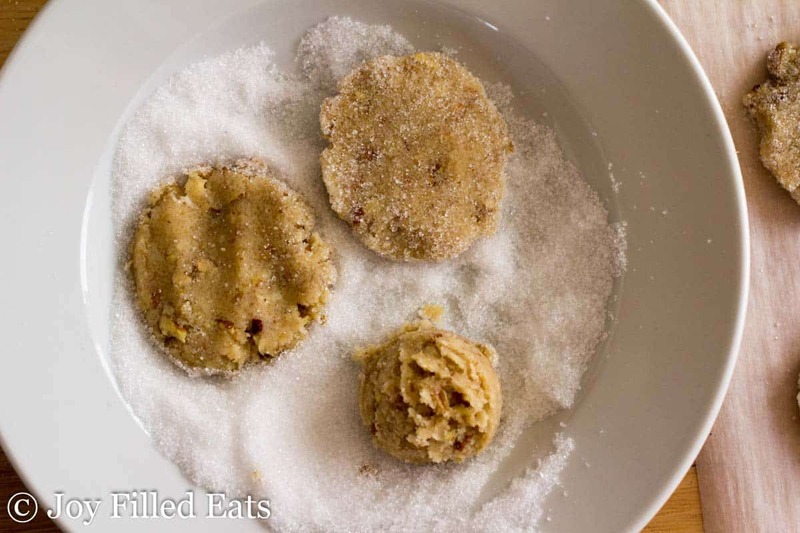 If you loved pecan sandies growing up I’m sure you’ll love this recipe too. They are ready before you could even put on your coat and head out to the store to buy a package. 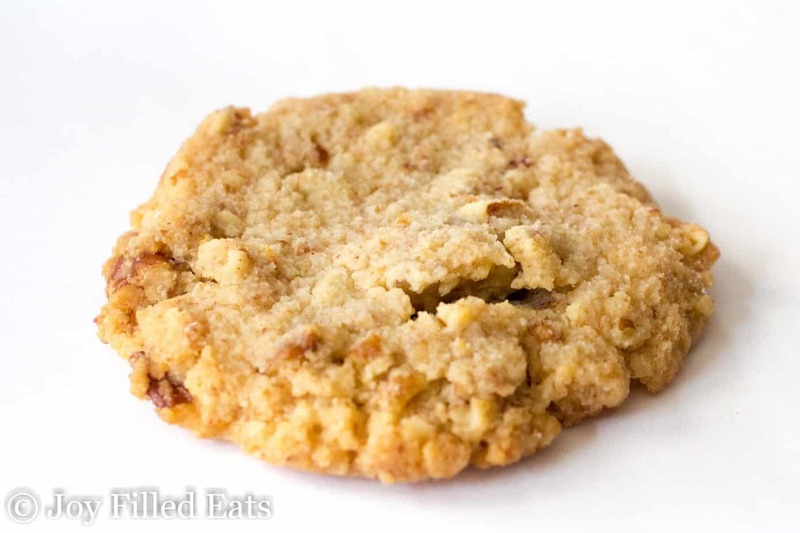 And with healthy ingredients, my pecan cookies recipe is the better choice. Using a food processor to mix up the dough for these is the way to go. If you don’t have a food processor you can finely chop the nuts by hand and then cut in the butter with a pastry cutter until the dough looks like my dough in the above photo. Rolling the dough in sweetener and pressing them out helps to create a crisper cookie. 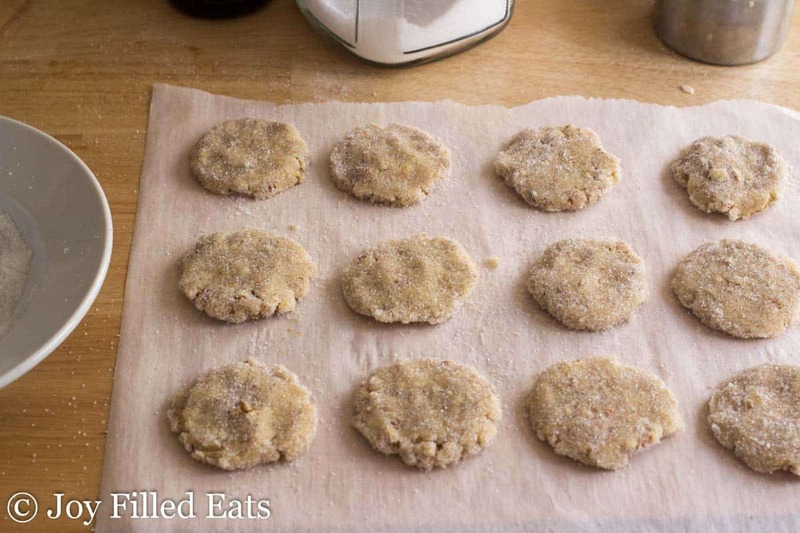 It can be tricky to get cookies with almond flour to firm up like a traditional shortbread. Using gelatin in place of eggs in recipes is the trick I’ve found to crisp up cookies made with alternative flours like almond flour and coconut flour. I use gelatin in place of eggs in my other eggless cookies too. All of these cookies are eggless! This recipe makes 16 medium sized cookies perfect for dunking into a glass of reduced carb milk to serving alongside a cup of steaming coffee. I always add them to my cookie trays at Christmas and have frequently gifted them to family and friends. These Butter Pecan Cookies live up to their name. They are buttery and chock full of pecans. They are crisp, sweet, and are the perfect sweet bite after supper. Combine the butter, almond flour, coconut flour, 1/3 cup of the sweetener, gelatin, and vanilla in a food processor. Pulse until wet crumbs form. Add the pecans. Pulse until they are chopped. The dough will come together into a ball as the pecans are chopped. Divide the dough into 16 pieces. Put the remaining 1/3 cup sweetener in a shallow bowl. Roll each piece of dough into a ball. Put in the sweetener and press it into a disc. Flip it over and press again so both sides are dusted with sweetener. Put on the prepared baking sheet. Repeat. Bake for 17-19 minutes or until the edges are golden. These are my hubby's favorite THM cookie! They are delicious!! I think I'll try adding sugar free chocolate chips next time. YUM! Thanks for the great healthy recipes! Ok, mine got about half way through baking time and they burned, I saw another person had the same problem, any suggestions? Unless your oven temp if off I have no idea. I've made these many times, in a few different ovens, and they always bake to the allowed time. I use this base dough in a bunch of other cookie recipes too. Have you checked it recently with an oven thermometer? I keep one inside my oven to make sure my instructions are accurate. 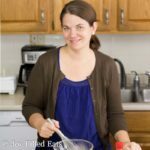 What is your general "conversion formula" for replacing eggs in a cookie recipe with the gelatin? They are FABULOUS, thanks for the recipe!!! I have so few things I can eat and pretty desperate for a crisp cookie. These sound fabulous! Unfortunately, I can't do almonds. Do you know if using all coconut flour would work? No, sorry, all coconut flour won't work and definitely wouldn't make a crisp cookie. Can I use different nuts in them and will it be the same about? Would Splenda work ok in this recipe? I'm sorry but I'm not sure. I don't use splenda. Wow these are by far the best keto dessert snacks I've made so far. I used 1/3c dark brown Swerve sugar substitute and 1/3c. Granulated Swerve, 5 drops Stevia which was the perfect sweetness! Seriously amazing cookie recipe! I also used the salted grass fed Kerry Gold Butter, as I always do in my baking which yields a perfect sweet and salty combo. THANK YOU!! I don't want to coat them in the sugar so would I put all the sweetener, 2/3 C, in at once? No, they are fine without the extra. Hi Taryn, I ended up putting all the sweetener in...then had to add more butter...but they turned out delicious...I can see why you coated them as they stuck when trying to flatten them! Will know better next time! Yes and yes. You will need more than the amount listed for that sweetener. I'd try 1.5 times the amount. You do need to flatten the cookies whether you dip them in sweetener or not. No, but I think you cut make a log and cut slices. Like an icebox cookie. Can I make these with eggs instead of gelatin? Yes, but they will be soft and cakey. I need to eat dairy free, do you think coconut oil and/ghee would work in place of the butter? Thanks! They should be fine at room temp for a few days but crisp up more when chilled so I do store in the fridge. Glad you liked them! Hi. Loved the cookies! Just to verify, the whole recipe is only 3 grams of carbs? Thank you! These are by far the best cookies I have made so far. I keep mine in the freezer and have to limit myself to just 1 or 2. I am not a baker and loved the simplicity of these and the food processor. THese will be my road trip snacks. Now I think I need to look at your other cookie recipes listed with no eggs. So glad there are folks like yourself helping us eat healthier. Will collagen peptides powder work instead of gelatin? I want to make these NOW!! Maybe. Sorry, I can't guarantee it. The gelatin is the binder in this recipe. If you use collagen the worst that would happen is they might be a little crumbly. They'd still taste great though! Thanks Taryn, I'll wait and get some gelatin today. Btw, I love your recipes. I made your Pecan Pie Tarts last week and they were devine! Mine taste great but are not crispy at all. Followed the recipe but mixed with my Kitchen aid. Any thoughts? It could be mixing in the kitchenaid. 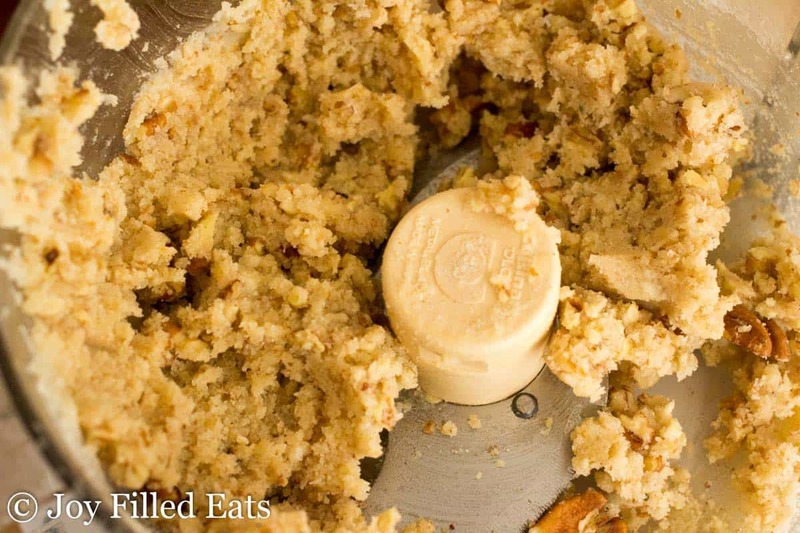 The food processor cuts in the butter, the kitchenaid mixes it in a little differently. But they will crisp up more if you chill them. These are excellent. I've never made cookies with gelatin before and I'm really pleased with the result. I will be making many more of these - and adding choc chips to some of them! Now I just need to find the perfect, crisp cracker for cheese. My husband will definitely be a keto convert then - all his favourite food groups covered! My daughter in law adds sugar free pudding to her cookie recipes and they puff up!! Just a question before I start baking these yummy biscuits. Two teaspoons of gelatin? Excuse my stupidity but I’ve only ever seen it in leaf form, so do I crush up two tsp worth or melt some and measure that any? Help please. You can buy knox gelatin in the grocery store near the Jello. many use it to make finger jello. I just made these after enjoying them in the past. However, they turned out way too dark. I double checked the temperature (350) and baking time, only 17 minutes of the 17-19 time suggested. Have you changed the baking time or did I miss something? After they've cooled I hope they taste as good as they did the first time. Hi Sharon, I have not edited the recipe. Could your oven be running hot? I made these the other night and they tasted wonderful....but mine didn't turn out crispy......I don't know what I did wrong but I will try again....They kinda fell apart when I picked them up....Any suggestions? It didn't stop us from eating them, though because they tasted so good. Hi Charlotte, did you substitute any ingredients? Did you bake them on parchment? So I don’t usually comment but I couldn’t help it. I bake not only for the food but because it evokes memories of family and warmth. Tonight, I made regular “off-plan” chocolate chip cookies for the family and was craving something sweet to snack on for myself. I found your recipe and decided to give it a try. I was so pleased with the results, it was easy, and I rejoiced in the success of a phenomenal cookie (which I’ve had trouble making on Thm). THANK YOU FOR THIS RECIPE!!!!! Would using just xylitol, or erythritol, and not a blended sweetener work out the same ? I don't care for anything with stevia in it. Thanks ! It should but you will need to add more. The sweeteners with stevia are stronger. The best! Scrumptious & a plus they're also easy. Most delicious LC cookies I've made. Yes, better than Pecan Sandies. Brilliant to add gelatin. Going to add to my never crisp cookie recipes. Thank for a major treat. So glad you liked them! The trick is subbing gelatin for eggs. If the other recipes are egg heavy just adding gelatin probably won't crisp them up. What gelatin do you use? I use knox. Any unflavored powdered gelatin will work. I can only have Stevia as a sweetener. Would just stevia work in this recipe instead of the blend? I don't think so, sorry. I think this needs the bulk of the sugar alcohols. Just tried these yesterday and loved them! I also gave some to the skeptics in family and they all said they were really good. I don't usually leave comments but this one deserved one. I'm always impressed with all of your recipes, there is not one I have not liked, you are great at what you do, keep going! Would THM Baking Blend work in this recipe? I don't think they would get the same crispness with baking blend. Made these today, they were AWESOME! My husband and I both really like pecan sandies, however I gave up refined sugars and flours a couple years ago so we have missed the... till now! Couldn't have been easier to make and we both agree that they taste better than the pecan sandies ever did. Thank you so much for sharing this great recipe..
can you use xanthan instead of gelatin? I'm not sure that would work in this recipe. The gelatin is the binder since these cookies do not have eggs. Where can you buy Gentle Sweet? What gelatin do you use? They look so yummy! I just use knox gelatin. The kind they sell in the grocery store. These look so wonderful. I can't wait to try them. Since we have doggies, we don't use Gentle Sweet in our home. We do have Sweet Blend. Do you happen to know how much Sweet Blend I could use in this recipe instead? Thank you! I just made these and have two comments, one I made have had my oven a bit too hot and therefore they turned pretty dark but do not taste burnt at all. Two, I tried to take them off the pan too quickly and they broke. You need to let them cool some on the pan to allow them to set more. They turned out just fine without the Geletin only the cookie is not crunchy as you'd expect. Do you think adding the deletion would have helped it to be a crunchy cookie? Yes, the gelatin helps them crisp. Making the cookies at this time and I don't have the Geletin. How important is it to include ? Not sure what part Geletin plays for a cookie. The gelatin is the binder since they don't have eggs. It also helps them crisp. Hi. I really appreciate your blog and all the hard work you put into your recipes. I was wondering, if we didn't have gelatin and wanted to put eggs for binding, how many would we put? Thank you! I'm not sure. Maybe one. But the cookies will not be crisp. They will be cakey. Can you use the THM Baking Blend instead of the almond and coconut flour? Maybe. Sorry that's not more helpful. I prefer almond/coconut in shortbread type cookies like these. It yields a crisper texture. If you try them with baking blend use a little bit less. Hi there I am just beginning THM and I am curious about substitute for almond flour. I don't tolerate it well and am hoing for a substitute in general for all of the recipes. Thanks for your guidance as I begin journey! It would really vary by recipe. You could try another nut flour if you do ok with one. Taryn ... these are soooo good! Loved them! I think this would be perfect as a snicker doodle (minus Pecans of course). I'm not a baker so I'm hoping to get some guidance from you. Could I just mix some cinnamon in with the gentle that is on the outside or would it be better added to the batter? Also .. how much do you think would be needed? So excited about this recipe! I love cinnamon so I'd probably do both. I think traditional snickerdoodles just have it on the outside though. Either way would work. Maybe 1 tsp of cinnamon. Where can I find a good gelatin? I just use Knox. It is available in most grocery stores. Do I have to order those sugars online or is there a store I can get them from? I'd like to make these but don't have the sugar. You may be able to find them in a local healthy food store. I normally do order online. Do these crisp up after they are cooled? I baked mine and they were more like soft cookies. I'm trying to figure out if they will crisp up more after they cool. They were soft coming out of the oven. Yes. You can refrigerate them for them to crisp further.